Pi is perhaps the most beloved number in the world. People devote an entire day to celebrating it; enthusiasts memorize it to hundreds of thousands of places; and it's even pretty useful for calculating the properties of circles and spheres. But pi hides some very important mathematical truths. Put another way, pi is just wrong. So wrong that physicist Michael Hartl says it's time to lose pi in favor of a new symbol: tau. We asked him to explain why pi has to go. Hartl is the author of The Tau Manifesto, which argues that, quite simply, pi is wrong. He's also a physicist who has previously both studied and taught at Harvard and Caltech. So what is tau? Well, simply enough, it's 2*pi, or 2π . Whereas pi is defined as the circumference of a circle divided by its diameter (C/D=π), tau is defined as the circumference divided by the radius (C/r=τ). Some of the reasons why tau is preferable to pi are rather subtle, but here's a basic way of thinking about it. A circle is, in essence, defined as a set of points that are all the same distance from a given point. That given point is the center of the circle, and that same distance is the radius, not the diameter. So doesn't it make more sense to use a formula that emphasizes the relationship between a circle's circumference and its radius instead of its diameter? But that's only part of the story, and to understand why pi is obsolete, we needed to talk to tau's champion. So we recently interviewed Hartl via email to find out just what's wrong with pi and why his proposed replacement tau is better. io9: 1. What's your academic background? How did you come to work on pi and tau? MH: My background is in theoretical physics (Harvard and Caltech), with a focus on dynamical systems and gravitation. These days, I work as an educational entrepreneur. A couple years ago, I noticed that Robert Palais' article "Pi Is Wrong!" (from 2001) had gotten a lot of attention on social news sites like reddit and Hacker News, but no movement had crystallized around it. I saw the opportunity for a social hack involving a more dramatically structured argument (The Tau Manifesto), a notation (tau) that people could use right away, and a holiday (Tau Day) that would serve as a focus and a rallying cry. Based on the number of people who wished each other "Happy Tau Day" this past June 28, I'd say it succeeded! In brief, what is your argument that we should switch from pi to tau? Circles are defined as the set of points a fixed distance (the radius) from a given point, so using C/r as the fundamental circle constant is far more natural than using C/2r. Given the amount of pro-pi propaganda that people have been exposed to, I don't expect them to be convinced by this, so I urge them to read the full Tau Manifesto before rendering judgment. What has the academic response been so far to your proposal? Academics ignore this issue for the most part. But many ordinary geeks have embraced tau with enthusiasm. Why did you choose the symbol tau? First, I'd like to note that physicist Peter Harremoës independently proposed using tau for the circle constant, and between the two of us we convinced Bob Palais (author of "Pi Is Wrong!") to get behind tau as well. 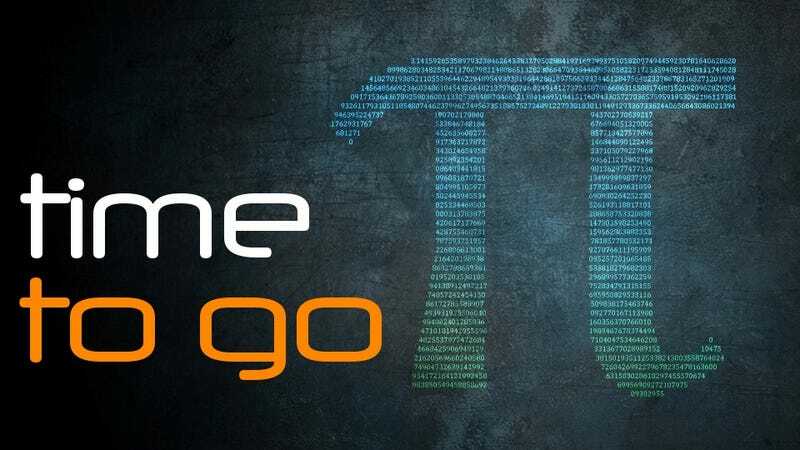 The use of tau was motivated by the Greek word tornos, the root of the English word "turn", and I also liked tau's typographical similarity to pi. In addition, while it's impossible to find a letter not already in use somewhere, there are surprisingly few conflicts with current scientific and mathematical conventions, and the conflicts that do exist are (I suspect) surmountable. Finally, the word "tau", as ordinarily pronounced in English, has a wonderful potential for puns, which serves as a counterpoint to "pi in the sky" and the like. Don't underestimate the value of this last point: pi is an important part of geek culture, and if you want to displace it you have to make its replacement just as much fun. For example, tauism is based on reason, not on faith: tauists are never pious. And if you think that the circular baked goods on Pi Day are tasty, just wait - Tau Day has twice as much pi(e)! I believe you've mentioned that tau reveals connections that pi does not. Could you provide an example of this? The canonical example involves radian angle measure. For example, a right angle is a quarter turn of a circle, and its measure is tau over four, or one-quarter tau. Using pi, the same angle is pi over two, or one-half pi, which obscures the natural relationship between angle measure and the circle constant. As discussed in The Tau Manifesto, using tau also helps reveal the relationship between complex exponentiation and rotations in the complex plane. The geometric meaning of Euler's identity, for instance, is much clearer when written in terms of tau. And what about counterexamples where pi seems more useful? For instance, the area of a circle formula (A = πr^2) seems far more elegant with pi than with tau. The formula for circular area is actually The Tau Manifesto's coup de grâce. You need to read the manifesto to get the full impact of the argument, but the short version is that the area of a circle has a natural factor of a half that disappears when using pi. Incidentally, all counterexamples I know of are addressed in The Tau Manifesto. When they hear about the basic idea of tau, some people (without reading The Tau Manifesto) object that "tau ruins Euler's identity" or "the formula for circular area is better with pi". When questions about software are answered in the software's documentation, computer programmers are notorious for responding with "RTFM", which stands for "Read The *ahem* Fine Manual". In this vein, I urge potential correspondents to Read The Fine Manifesto before voicing their objections. A potential parallel to this controversy over pi is the recent successful efforts by astronomers to demote Pluto from planet status. Both are possibly obsolete scientific concepts that nevertheless enjoy great popular support. Do you foresee a similar backlash to revising pi/tau, and what do you make of this? I don't think of this as a demotion of pi so much as a promotion of tau. It's as if, after further analysis, astronomers determined that Pluto's moon Charon is actually bigger than Pluto. In that case, it would be natural to call Charon the planet and Pluto its moon. The number pi still has historical importance, but its mathematical significance is that it is one-half tau. We'd like to thank Dr. Hartl for explaining tau's background and a little bit of why it's better than pi. But, as he says, this is a tricky topic, so be sure to check out his full manifesto for more detailed arguments why tau is better than pi, as well as Bob Palais's 2001 article "Pi is Wrong!" that started it all. And be sure to mark your calendars for the next Tau Day on June 28, where we can all help ourselves to double the pi!